This item is one official Scorpion W2 OCP name tape for the Army ACU embroidered with your choice of lettering (up to 15 characters). 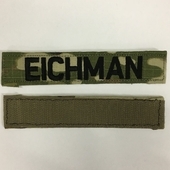 These Scorpion W2 OCP name tapes are made for official wear on the U.S. Army Combat Uniforms (ACU). These Name tapes have a hook and loop style back by default, but can also be ordered as sew-on.